Patients trust you to give them the best counsel on how to protect their health. Immunizations are important preventive measures – but it’s unlikely that getting vaccinated is on the radar for your adult patients. Strong recommendation from you is critical in ensuring that they get the vaccines they need to help them stay healthy. Adults are not getting the vaccines they need. The latest data from the Centers for Disease Control and Prevention (CDC) shows that vaccination rates for adults are extremely low (National Health Interview Survey, 2014). For example, rates for Tdap and zoster vaccination are 28 percent or less for adults who are recommended to get them. 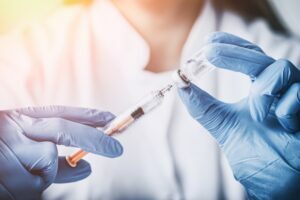 Even high-risk groups are not getting the vaccines they need – only 20 percent of adults 64 years or younger who are at increased risk for complications from pneumococcal disease are vaccinated. This means that each year tens of thousands of adults needlessly suffer, are hospitalized, and even die as a result of diseases that could be prevented by vaccines. Your patients are likely to get the vaccines you recommend to them. Clinicians are a valued and trusted source of health information for adults. Your patients rely on you to let them know which vaccines are necessary and right for them. Since many adults are not up to date on their vaccines, all health care professionals should use every patient encounter as an opportunity to assess whether any vaccines are needed. If the patient is due for a vaccine, make a strong recommendation that you advise getting the vaccine because it can help protect them against a disease that could be serious. For some patients, this may be sufficient information to accept the vaccine. Others may want to learn more about the vaccine and why it is right for them. For these patients, sharing the following can help them make an informed decision. Share the tailored reasons why the recommended vaccine is right for the patient, given his or her age, health status, lifestyle, job, or other risk factors. Highlight positive experiences with vaccines (personal or in your practice) to reinforce the benefits and strengthen confidence in vaccination. Address patient questions and any concerns about the vaccine, including side effects safety, and vaccine effectiveness in plain and understandable language. Remind patients that vaccines protect them and their loved ones from many common and serious diseases. Explain the potential costs of getting vaccine-preventable diseases, including serious health effects, time lost (missing work or family obligations), and financial costs. Some patients may need additional time to consider information about vaccines or want more details than can be provided during a single office visit. There are a number of things you can do to help these patients stay on track with recommended vaccinations. Provide educational materials or trusted websites for them to review. Send reminders about needed vaccines. Document the conversation and continue the discussion at the next visit. To download free patient education materials or find resources on addressing patient questions and concerns about adult vaccines, visit: www.cdc.gov/vaccines/hcp/adults. How can Telligen help you? There is no perfect solution to increasing immunization rates. Rather, successful campaigns typical involve a number of interventions and a combination of tools and techniques unique to your practice. Telligen can help you to develop and implement resources that will be effective at increasing your vaccination rates. This technical assistance can be performed via teleconference, webinar or in-person. We are here to support you! August is National Immunization Awareness Month (NIAM) – a reminder of the importance of immunization in keeping our communities healthy. Your strong recommendation can make a difference.